City officials agreed to revise city codes to allow more permitted uses, which will increase the types of businesses that can occupy existing buildings. Parts of the old zoning code were also eliminated because of inconsistencies with provisions in the city’s development code. In addition, new business approvals can now be made at the staff level rather than going through a long review and public hearing process. These changes are slated to cut the time it takes to get a new business to gain city approval, which will also reduce staff expenses while increasing revenue to the South County city. Not going to happen until demand is there. Grand in Grover is a graveyard of failed businesses mostly restaurants. There’s always a new business willing to try but it’s only a matter of time before they give up due to lack of demand. So what’s going to create demand? By far the best thing would be a massive pier at the end of Grand. A pier that puts the Pismo pier to shame. Then, great parking. It would all snowball from there. Thousands more visitors a day. More taxes, more infrastructure etc. Grover could be Pismo times 3. But it’s never going to happen. Too many people against growth, a coastal commission with it’s head in the sand, a lack of willingness by the state, which owns the beach. You’ve got the dunes attracting something like 50,000 visitors a week and you can’t even put a pier and parking right next to them to give them something to do other than break their necks riding quads. It’s basically a sad state of affairs that a community with as much potential as Grover (and Oceano for that matter) are so low end. The community is overrun with welfare recipients and unemployed. It’s depressing to just walk around Grover and see so many people doing absolutely nothing with their lives. Unfortunately, the reality is that Grover is severely in debt. Tax revenues are down. Infrastructure, especially the roads, are falling apart. No money to do anything but barely survive. And there’s no end to the pain in sight. That’s an apt description for much of the US. This is true, but I heard there is a “slight” and when I mean slight I mean it, that a fashion-orientated shopping center could open on West Grand Avenue. Yes, like the ones with higher end stores like Jos. A Bank, Express, and Ann Taylor. This could potentially resurrect the city. I am not sure about a grand pier. I like the idea, but maybe something more practical like trails and bonfire pits (i think bonfire pits might already be there), and something else to accomodate the new resort. BTW, is it even possible for residential growth in Grover Beach or is it land locked by Pismo, Oceano, and AG? Seems to me maybe in the hills of North Grover. I am intending to move to South County in a couple years. I am looking at Pismo, Grover, and AG. If Grover does it right and has a nice shopping and dining venue, then I would chose there. Also, get a south county Hancock campus in Grover or AG. Gosh, the kids of south county deserve a better community college education than what Cuesta offers. Hancock is a wealthier and larger campus and offers WAY more. I wonder if I ran for council one day if people would elect? Since not many people are running. There are really no large open undeveloped areas in GB suitable for commercial building but there are enough smaller ones and enough areas suitable for tear-down-and-redevelopment that they could accommodate a substantial buildup if someone with the resources to do it was convinced that it would be a worthwhile investment. There are industrial lots off Farroll in S. Grover available and also a large tract suitable for housing. There are numerous residential lots that are not developed although not all of them are available for that. I am happy to see that they are making the changes although the devil could be in the details. I was looking for a combination residential/commercial location there a couple of years ago. Although I think it would not have worked financially anyway, the zoning restrictions along with the cost and hassle of building new stopped me from moving beyond initial investigation. As for the beach itself (State Beach property), I like it pretty much the way it is — accessible but not crowded. I hope that any development is minor. Those of us who like the quieter atmosphere need a place to enjoy locally too. 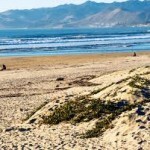 Let the folks who like a commercial beach experience go to Pismo and those who like to hotrod through the dunes go to the play area south of Oceano. I could see an eventual connection between the PB & GB boardwalks, a small expansion of the parking lot and, maybe, a small lodging establishment away from the beach. Anything more would change (and, IMHO, destroy) the particular character of this beach. Read it, know it, speak it. West Grand and between Oak Park and 14th Street (not sure what is there now) is designated for commercial retail use and that is where I think a developer wants to build a 160,000 sq. ft. lifestyle center. Also, between Highway 1 and Fifth Street in the Visitor Serving District is another potential growth area for retail. I believe most of the plans in West Grand Avenue Plan is redevelopment and that’s why the city has cut down on policies and is cutting costs for developers. 1) A 160,000 sq. ft. lifestyle center with Loft, Jos. A Bank, Williams Sonoma, Sur La Table, Gap, Lucky Brand, Hollister’s, Starbucks or Coffee Bean, Coldwater Creek, Anthropologie, PF Changs Bistro, Qdobe Mexican Grill, Pick Up Stix, Johnny Rockets, and more. If the outlet mall is doing well I know a lifestyle center will do well too. 2) A boardwalk connecting Pismo and Grover Beach. Not sure who would want to build in Grover. Pismo or AG are prob better locations. AG has land on East Grand Avenue and some land on East Brand Street. I’m sure it’s possible for something to go into Grover Beach, but not sure. Maybe The County Planning Department will catch up with the likes of Grover and realize that life is a Beach. County-wide, the private sector needs their supportive help too. but it is high time for all the cities in this county to accommodate those who wish to bring money and business into the area. Maybe they will. They have the Wal-Mart Center. I suggested they build a smaller lifetstyle mixed use center. Tha so-called ‘private sector’ has ONE objective: Profits. If they want to operate under a system of “free-market-enterrprise” then they should sink or swim without any government assisstance. If businesses provide some societal function, then they could be helped by government; but with strict regulations on compensation and other payouts. The risk for graft is too great, otherwise. Have you ever owned a “legitimate” business — i.e. one with all the applicable permits, licenses and registrations? From your comments, I doubt it — or you were lucky enough to have a business with minimal government oversight. I have a small, one-man service business which requires licensing by every local government in whose territory I operate, by the city in which my business is located (zoning, fire-inspection) by separate county and state agencies for different aspects of my business as well as tax agencies. I intentionally designed my business model to not sell material items to customers to spare myself the hassle of sales tax and, for now, I contract for any labor I need to avoid the numerous agencies, state and federal, which take an active role in regulating employers. It isn’t so much the cost (except Workman’s Comp.) but more the enormous amount of time required that discourages me. I must research the regulations, iron out conflicts (some really obscure and trivial), file numerous forms and reports, pay bills and keep up on all the changes that are made — often on an annual basis. Then there is the lack of consistency in regulations, reporting formats and payment period schedules which add up to wasted time and accidental errors if my focus is diverted at the wrong time by something as unimportant as my customers’ needs. Interesting approach by Grover Beach; I do wonder about possible “unintended consequences” though. Is there going to be a possible impact on the “quality of life” that most zoning requirements try to protect? Will there be conflicts between different zoning issues going forward? Does this move have any possibility of reducing the staffing of city personal? I do applaud the ideal of making certain zoning issues more simple, I just hope that they tread carefully though so that they don’t end up with a very haphazard patchwork of multiple use zones all stitched together resulting in an untenable arrangement for some who may live near the newer zoned and approved without review projects.